The City of Rochester denied our appeal for the sources of outside income for elected officials and the deputy mayor. 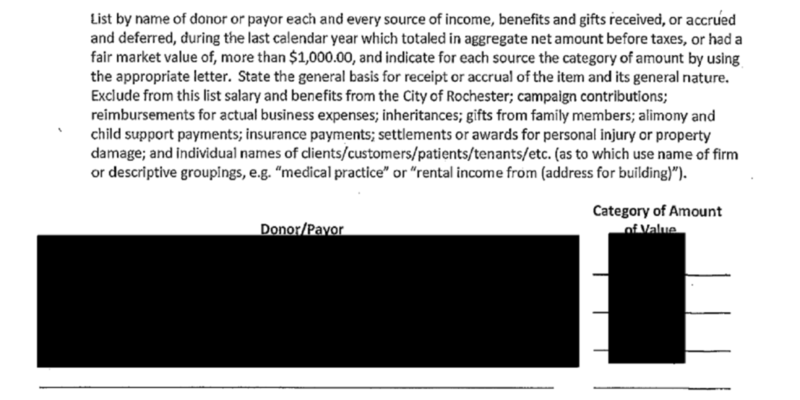 The sources of income were redacted for many officials on the annual financial disclosure forms we obtained through open records. The city claimed revealing the sources of outside income would “constitute an unwarranted invasion of personal privacy.” The city’s position is the public is only entitled to know if officials are paid by an entity doing business with the city. Robert Freeman, the director of the Committee on Open Government, disagrees with the city’s position. Freeman also pointed to Rochester’s City Charter, which states the city can withhold the amounts of the income, but it says nothing about withholding the source. This is the first year city officials have had to disclose all sources of outside income. Rachel, it’s taken a while but I’m finally coming around to seeing your side of the story and how we need to be vigilant the way our city is run. A FOIL is NOT a FOIL if it’s all blacked out. What are they hiding? With recent news on the Rochester Housing Commission and now the report on our city schools, I look forward to joining you in keeping our public officials and boards accountable. Is there a significant cost to filing all these FOIL requests?